These unique and powerful multi energy boilers can run with up to six different forms of energy, simultaneously. They offer the ultimate flexibility when choosing the heating system and even further, they can be changed to use a different type of fuel at any point in the future. 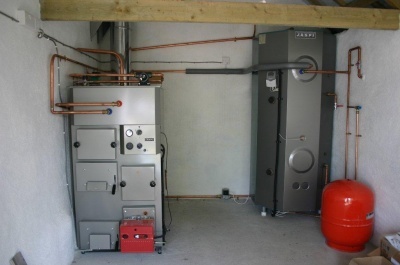 For the user, Jaspi multi energy offers the convenience of an automatic burner boiler, like an oil or a gas boiler, the economics of a traditional wood boiler and the cost saving of the renewables - all in one unit. To further increase the choice of fuels, all our multi energy boilers have a built-in electric backup heater which can be used to boost the power output when the heat demand is high or as a sole source of heat when less heating power is needed. This electric element can also be powered by solar photovoltaic panels, water- or a wind turbine. In short, for example a Jaspi Duo 2 boiler can use; Oil, Wood, Solar thermal, Solar photovoltaic, wind and mains electricity simultaneously. With this kind of flexibility the boiler can run for example with solar and wind as main heat sources and the wood and oil are only for a back-up. We have customers who are running their boilers this way, effectively heating their property for free for the most of the year. Our multi energy boilers are extremely simple to use. Most commonly they are used as a normal oil or gas fired boiler during the week and at the weekends the logs are burned to reduce the oil consumption or, if connected, to charge an external heat store. The user does not need to do anything when changing from oil to wood, simply light up the logs and when the wood is at the running temperature, the oil / gas burner automatically shuts down. If the boiler is connected to the solar, wind or hydro power, these can have the priority and the oil and wood are only used as a back-up. 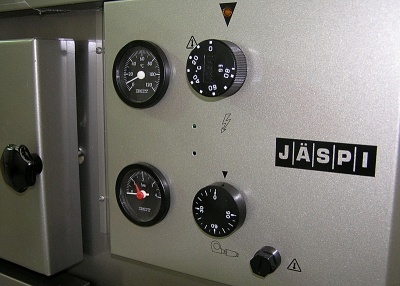 Jaspi multi energy boilers have two burning chambers side by side, one for solid fuel like logs, large briquettes, blazer logs or any other compressed fuel logs, for example peat. The second burning chamber is for the burner. 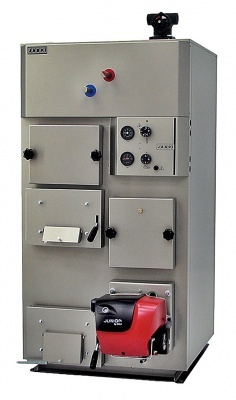 This burner can run on oil or biofuels, gas, LPG or pellets. As standard our boilers are delivered with a Riello oil burner. This burner can be easily adjusted to match the property's heat demand between 19-35kW. The power adjustment table can be found here. These boilers need only one flue which must be rated to class 1 for solid fuel. Balanced flues will not work as the boilers need a good draught to work. These boilers have a large internal water tank so they can be connected directly to the domestic hot water system and radiators / underfloor heating without a need for a hot water cylinder or a thermal storage tank. If logs are used frequently, it is recommended that the boiler is connected to a thermal storage tank. This increases the capacity of the stored heat and the wood boiler's efficiency. An external thermal store should also be used if the heating system is expanded to other heat sources like larger solar thermal systems and heat pumps. Duo 2, Triplex 3000 and Biotriplex boilers can also be fitted with a separate solar coil which allows a direct connection to solar thermal panels (max. 4sqm). The solar heat is then transferred directly to heating and domestic hot water without a separate buffer tank. If the solar panel area is larger than 4sqm, we recommend that a thermal storage tank is added to the heating system. All our multi energy boilers are fitted with a domestic hot water coil and a Termomix heating mixing valve. The powerful domestic hot water coil will produce mains pressure hot water as and when it is needed like a combi boiler. Termomix heating mixing valve connects directly to the heating flow & return. This valve can also be fitted with an automatic temperature controller, which will adjust the temperature of the radiator flow water for example when the outside temperature drops. An additional heating mixing valve set can be added to all of our multi energy boilers. This allows the boiler to supply two separate temperature heating flows which is often used in houses with a mixture of radiators and underfloor heating or if a part of the property is used only occasionally like an annex.